Is Mexico Finally Getting Over Its Hang-ups? Over the summer, on a visit to my old hometown of Chihuahua in northern Mexico, a place wracked by drug cartel violence in recent years, I met with Javier Contreras Orozco, the editor of the city’s leading newspaper, El Heraldo. He told me that when the drug violence first exploded onto the scene a few years back, the paper carried the spectacular killings of rival cartels in gory detail on the front page. The press knew a sensational story when it had one, and it relied on narco-military patois to exalt and fetishize the subject. Killers became “sicarios,” gangs became “comandos,” and murders became “ejecuciones.” Soon, though, media outlets like El Heraldo found themselves in the horrifying position of being ordered by cartels to cover their crimes and convey their messages and threats to rival gangs, who often accused the paper of being in cahoots with whoever was sending the message. Eventually, the newspaper decided enough was enough. Instead of having drug violence bleed throughout the entire newspaper, El Heraldo created a separate new section, “Justicia,” which contains all the gory violent news. “Now it is up to the reader: You can revel in the latest violence and follow it closely, or you can choose to do this,” Contreras said, as he slipped the “Justicia” section out of that day’s edition on his desk and tossed it in the garbage can. That conversation stuck with me, and El Heraldo’s new approach parallels how the broader Mexican society has dealt with the drug violence ever since President Enrique Peña Nieto of the Institutional Revolutionary Party (PRI) came into office a year ago: by putting things in perspective and moving onto other things. Peña Nieto, a former governor of the state of Mexico, has proven masterful at walking a fine line between continuing the war on the cartels and ceasing to seem consumed by it. His predecessor, Felipe Calderón, of the conservative National Action Party (PAN), seemed able to focus on little else besides the drug war in his six years in office, making the struggle look all the more daunting to the public. Peña Nieto understood that Mexicans desperately wanted to change the subject, to place boundaries around the issue much like El Heraldo has done. This hasn’t meant an abandonment of efforts to take on the drug cartels, but simply a decision to treat this as a subject properly delegated to security and law enforcement officials, while the president focuses on bigger topics like education, energy, and the economy. Peña Nieto has conveyed this to Washington, too, and on separate trips to Mexico City this year, both President Obama and Vice President Biden went out of their way to avoid the subject, talking instead about the importance of the two nations’ economic relationship. 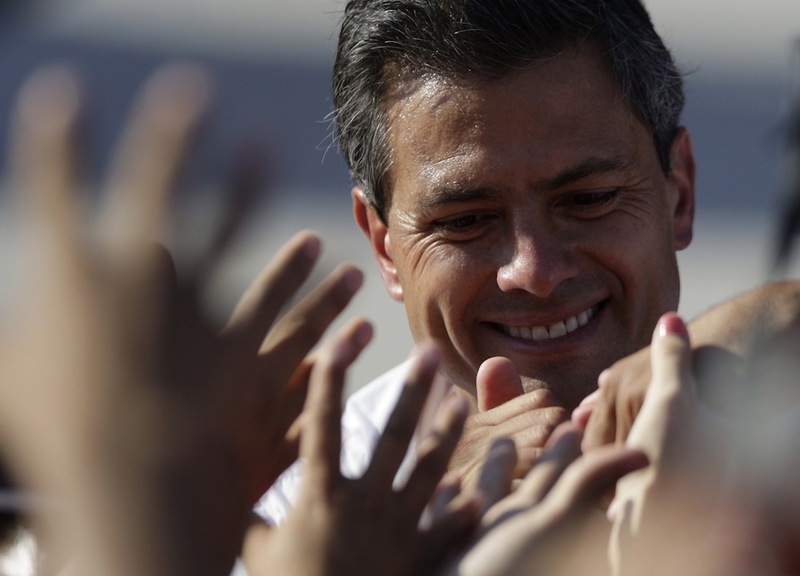 Peña Nieto’s shift hasn’t just been cosmetic. The change of subject has been substantive as well. Defying the conventional wisdom that presidents should focus on one or two priorities at a time, Peña Nieto has unleashed an ambitious reform agenda, allying with opposition parties in Congress to push hard for an education reform that diminishes the power of the national teachers’ union, new antitrust laws that threaten the power of telecom and media monopolies, and a political reform to make elected officials more accountable. And now, this week, the Mexican Senate has passed the administration’s most important proposed reform—constitutional amendments aimed at allowing significant private and foreign investment in the oil industry for the first time since it was nationalized in 1938. The measure still requires approval of the lower chamber of Congress and a majority of the states. To call the energy reform an effort to boost Mexico’s economic competitiveness is both accurate and a massive understatement. For decades, Mexico’s oil has been almost sacred, a substance to be extracted only by Mexicans—all under the umbrella of the country’s state-owned oil monopoly, Pemex. Changing this is only the latest step in a far larger project of tackling the national neuroses standing in the way of Mexico fulfilling its potential. This is no small matter for the United States, culturally, demographically, and economically tied to Mexico to a degree most Americans do not begin to appreciate. Mexico’s underlying potential as our North American partner is enormous. Our southern neighbor, with its 110 million people, is already the second-largest buyer of U.S. goods, our third-largest trading partner overall, and an important source of imported oil. As the North American Free Trade Agreement, or NAFTA, turns 20, Mexico exports more manufactured goods than the rest of Latin America combined. The Wilson Center’s Mexico Institute has found that 40 percent of all Mexican exports heading north across the border include value-added content from the United States (the equivalent figure for China is only 4 percent), a testament to how integrated the two economies are as a single manufacturing base. Goldman Sachs predicts that, by 2050, Mexico will be one of the world’s five largest economies (it currently ranks 14th), with a GDP of nearly $10 trillion. Peña Nieto’s proposed energy reform, much like the education reform that preceded it, has triggered demonstrations on the streets of Mexico City, orchestrated by Pemex’s powerful unions and elements of Mexico’s demagogic left, which view any tinkering with the status quo as a betrayal of immutable principles of Mexicanidad. Peña Nieto’s approach has been a surprise to the many who viewed the president’s party, the PRI, as the reactionary guardian of the status quo. After all, the PRI ruled Mexico in authoritarian fashion for most of 20th century, and it cynically opposed many of the current proposed reforms when it was in opposition. But Peña Nieto, a telegenic politician consistently underestimated by the nation’s chattering classes, is fond of comparing his reforms to Nixon going to China. The energy legislation is more ambitious than many expected, allowing foreign oil companies to partner with the Mexican state on a profit-sharing basis, along the lines of what Brazil’s Petrobras and other more modern state-owned oil enterprises do around the world. The trick is finding a framework that will attract foreign capital, desperately needed to expand deep-sea exploration and production, without appearing to cede sovereign control over the nation’s mineral resources. Mexico’s oil production peaked in 2004 but has gone down 25 percent since, in part because the federal government treats Pemex as a piggy bank to balance its books rather than as a capital-intensive business that needs to reinvest a healthy share of its profits into its operations. Mexico has also slipped from second to third in the list of foreign suppliers of oil to the United States. Prospects for changing the energy status quo are not bad. Mexico has changed dramatically since the passage of NAFTA two decades ago, abandoning a closed, socialist orientation to become one of the most avid free traders on earth, and its proximity to the United States is starting to reap greater dividends, as China loses its competitive edge as an alternative manufacturing base. The country still has its share of formidable problems, including the ongoing drug violence, underperforming schools, regions of persistent poverty, and, worst of all, endemic corruption at all levels of government. But its deepest psychological challenge may be to close the gap between what the country has become and how it sees itself. The most common nationalistic instinct is to cling to the identity forged during Mexico’s early-20th-century revolution, that of a victimized Latin nation forever forced into a defensive crouch against the colossus of the north. But that is just one anachronism among many. As Mexican novelist Carlos Fuentes once wrote, Mexico has a dysfunctional commitment to the preservation of all historical periods, so that “no one Mexican time is completed … but can remain a subverted Eden to be alternatively returned to and forgotten.” It’s a narrative of a colony exploited by Cortés and all who followed him. Whether Mexico can tackle the necessary educational, political, and energy reforms to meet its challenges is a test of whether the country is ready to align how it governs itself with its new reality as a prospering democratic member of the North American community. The fate of the energy reform in coming days will say a great deal—not only about the fate of its oil production in years to come, but also about the extent to which our neighbor can get over its historical hang-ups, and take its rightful place in the world. Andrés Martinez is editorial director of Zócalo Public Square and vice president of the New America Foundation. Primary Editor: T.A. Frank. Secondary Editor: Joe Mathews. *Photo courtesy of REUTERS/Daniel Becerril.